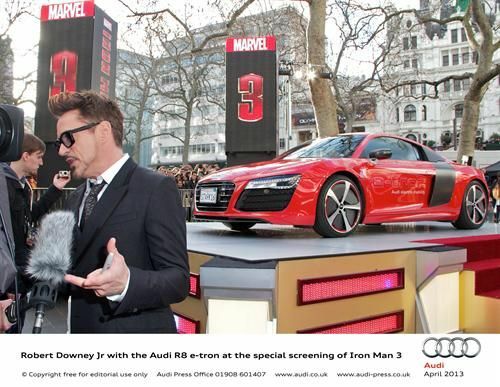 In its signature humble fashion, the Audi R8 e-tron was quietly deferring the spotlight to some of the supporting actors of the new film, Iron Man 3 at its debut night in London's Leicester Square. As cast extras like Robert Downey Jr posed for cameras and talked with VIP guests to the premier, the R8 e-tron quietly shimmered under photographer's lights. Guests who filed into the movie over the red carpet were obviously cowed by the movie star's commanding presence and noble demeanor. Graciously calling the film's other actors "co-stars," the Audi e-tron allowed others like Robert Downey Jr to accept the spotlight for a few moments of glory. Their fifteen minutes of fame spent, the lesser actors entered the theater for the private screening of the new Iron Man 3 film, the latest in the franchise in which the Audi R8 family has starred since its inception. Conspicuously absent from this screening was the celebrated Acura NSX, which appeared as a one-off concept in a spinoff film The Avengers. Previous films featured the Audi R8 Spyder. Fans of the new film and its electric-powered star, the Audi R8 e-tron, can put some skin into the Iron Man 3 game by submitting drawings to the Audi and Iron Man 3 Steer the Story Contest to show how the final scene in the Audi R8 e-tron's story pans out. No official word from the e-tron's management as of yet, but rumors are buzzing about the star's next possible performance. The most credible of those point towards another DC Comics film venture and a rumored replacement of the aged Aston Martin DB5 for the Bond film franchise. Of course, we all know that rumors in Hollywood should never be the basis of a bet.